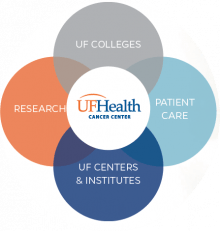 The Cancer Center has a membership of more than 230 researchers and clinicians from across the University of Florida and UF Health, a Top 10 public university and the Southeast’s more comprehensive academic health center, respectively. The UFHCC and its members are dedicated to providing leading-edge cancer care and conducting original research for the prevention, early diagnosis and treatment of cancer. Many of the Cancer Center’s members are part of the UF Health system, which encompasses six health colleges, eight research centers/institutes, two teaching hospitals, six specialty hospitals and a host of physician medical practices and outpatient services throughout North Central and Northeast Florida. Additionally, more than 90 percent of the center’s members also serve as faculty; the Cancer Center boasts members from 11 UF colleges. Members may also hold affiliations with other institutes and centers across the university or serve as physicians for the UF Health Shands family of hospitals and clinical programs.